Last year, I visited the Palace Museum in Udiapur twice to make photographs. I lost almost all of the photographs once I was back in Texas because I dropped my external hard drive down the stairs. The lesson there, always put the external hard drive in a bag don’t ever carry it on top of your tablet. So about two weeks ago returned to the Palace to make some new photographs. Some of them are the same photographs I made last time but others are new. At the entrance to the Palace Museum is this shrine. I know that I photographed it last time, so I photographed it again. However, this time I did not have much passion for the photograph. I guess interests change over time or perhaps I just realized there was more interesting subject matter inside. At any rate, I stopped to make this photograph on the way in. You might as well make the photograph while you are there instead of later wishing you had made the image. As soon as I entered the Palace I began making photographs. There is decorative tile inside the stairs that you ascend going into the Palace. But when I was going through editing the photographs I did not think any of them were worthy of putting them in the blog. Once you are off the ground floor there are many views of the city. The Palace is worth the visit just for the views. In the photograph above you can see a traditional Rajasthani structure framed by trees with the Aravali Hills in the background. It is quite romantic. Even more romantic with a sunset. A vast view of the city is also available from the Palace. In the foreground of the photograph above part of the Palace is visible. Beyond that the city stretches back for miles until it reaches the Aravali Hills on the horizon. I always think of Udaipur as being a small town. It has a conservative small town vibe. But the reality is that the city is huge. 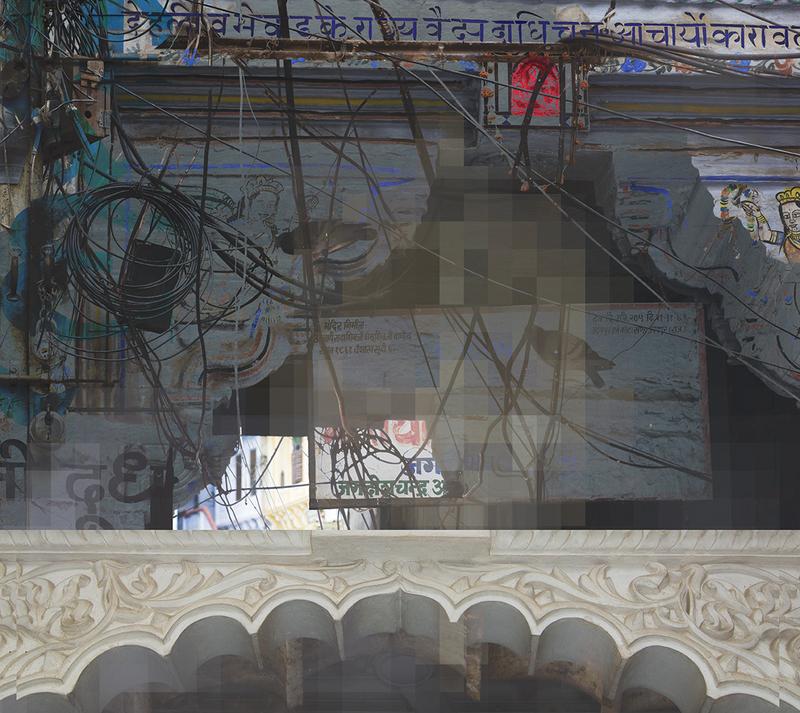 According to Google the population of Udaipur City in 2011 was 451,735. Google also says that Udaipur only covers 14.29 square miles, this seems small. If that is the case it seems like all 14 of the square miles are in the photograph above. Back inside the Palace I have a huge interest in the way the walls and ceilings are decorated. There is one small room painted like the photograph above. The floor is covered in the zig-zag pattern black and white tile. The background of all the walls is the red-orange color you see above and then painted with the lotus and other flower like a wall paper. I think it is really beautiful. Over the past few years I have really come to enjoy the motif of the lotus. I want to get a lotus tattoo. One day I will. There is another space in the Palace on the top floor that is partially open to the sky. The walls are covered in these tiles and have these niches in them. They are very elaborate. I love the tiles inside the niche, they are European scenes. Beyond the scenes being European, the blue on white porcelain was taken by the Europeans from the Chinese. The space has a strange international feel. This is my favorite ceiling in the Palace. 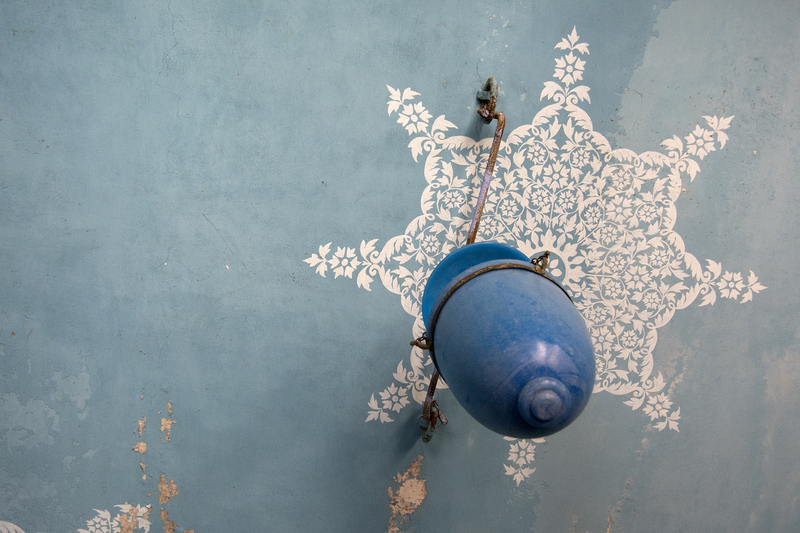 I love the soft powder blue paint and the beautiful white hand-painted floral motif. In terms of the photograph, the antique blue light fixture ads another element of design. The colors shapes and textures of this photograph create a really beautiful composition. For me this photograph made the trip worth it. Another nice lighting/ceiling combination can be seen in the photograph above. 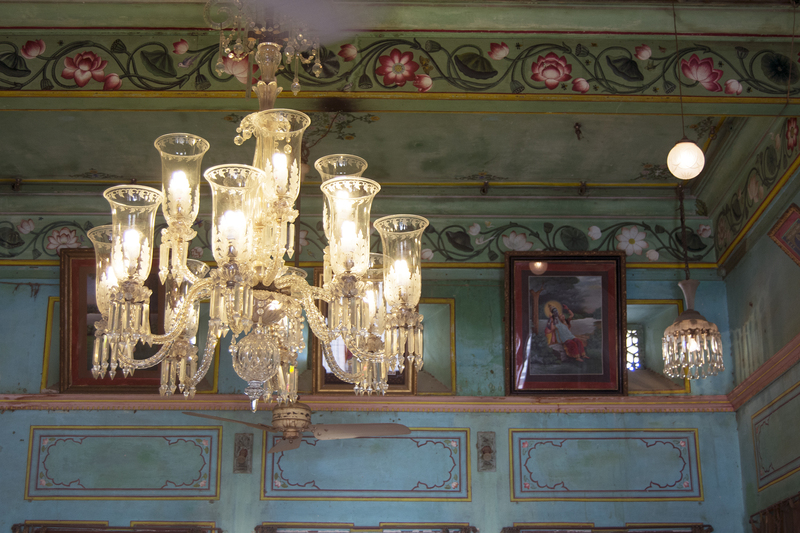 I was really drawn to this chandelier on this trip. This room is so over the top. The chandelier take the room to a whole new level. The hard glass contrasts sharply with the soft painting on the walls. The Palace doorways are often arches. The photograph above shows the top of an arch at the bottom of the frame. I made a similar photograph to this one last year. I used it for one of my composition in Udiapur Remembered (below). 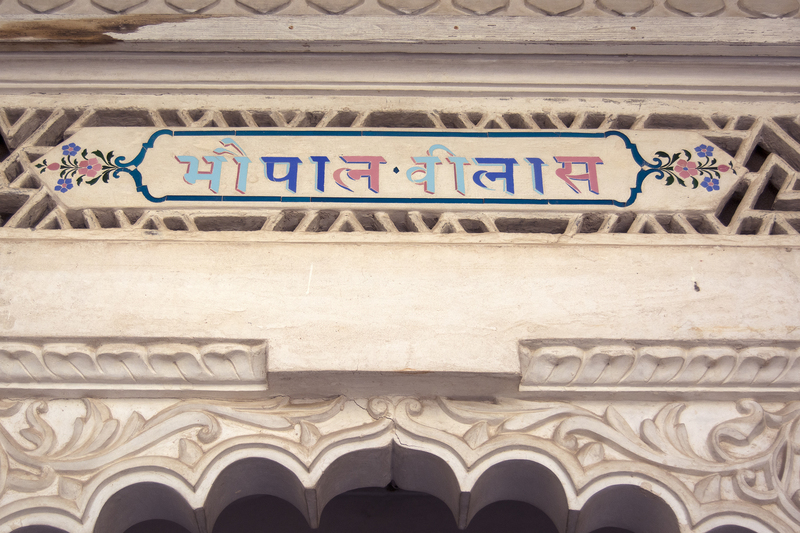 I really love the Hindi letters painted in candy colors on the white stone. The rooms of the Palace are insane. I question how anyone ever lived functionally in them. You have seen some examples of overly painted and overly tiled rooms. 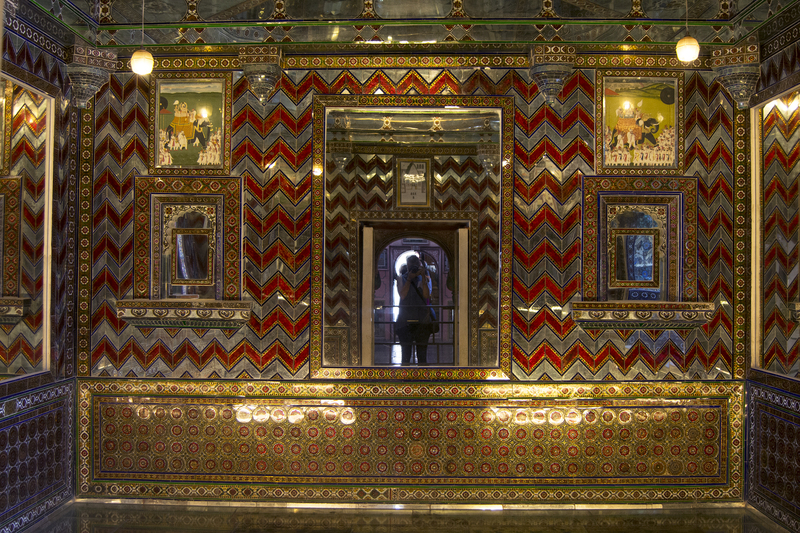 But some of the rooms take it to the next level with mirrors. They are crazy rooms to try to function in but they are amazing for photographs and I wish I could get permission to make art photos in the rooms with my tripod. See the two rooms below. This room above is my favorite. It is mirrored and the windows have stained glass. There is nothing better than this room anywhere. I would be in heaven if they would actually let me in the room. These rooms can only be viewed from the doorway. But this room is what a photographers dreams are made of. This room is mirrored with gold and red accents. It is so insane. I feel like this room is less classy than the one shown above it. However, it is still a great place for a photograph. A photographer can not resist the opulence. In the end, I went back to my own photographic interests. I came across this reflection in the glass. 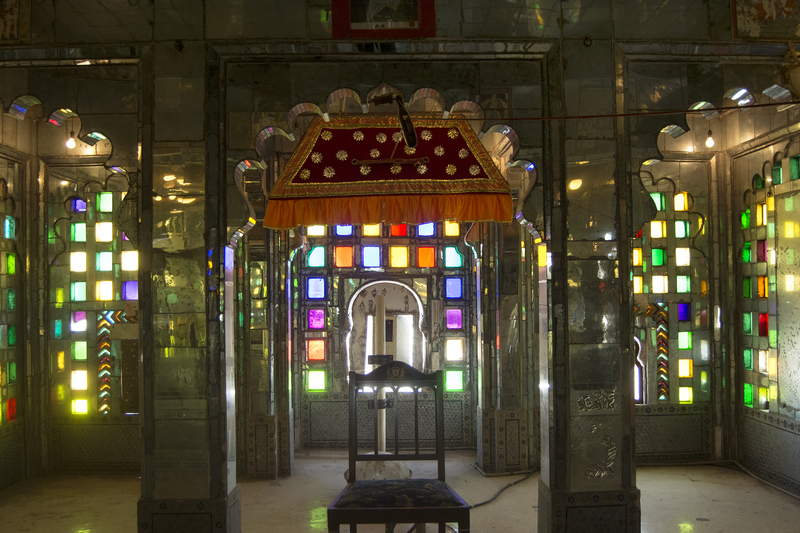 If you read the last Rajasthani Impressions post, you saw another reflection photograph I made. I really like this one because it is almost impossible to tell which part is real and which part is the reflection. This new reflection obsession continued on my next photography outing. However, this took place in Delhi not Rajasthan. I think the Palace is a beautiful place and a great place to make photographs. 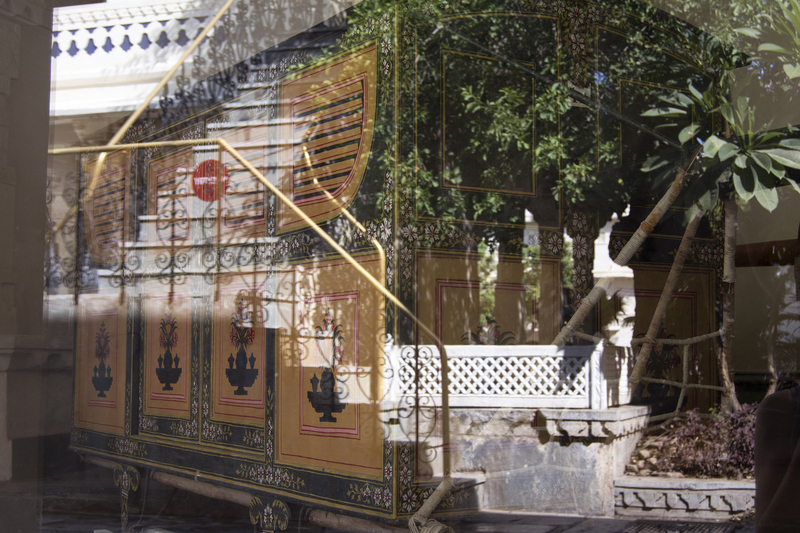 If you are in Udaipur be sure to visit the Palace, even if you have visited other Palaces in India this one is worth the visit. If you have a camera you have to pay to take it in and use it but I think it is worth it. I would recommend visiting the Palace during the week so there are less people. Happy shooting!